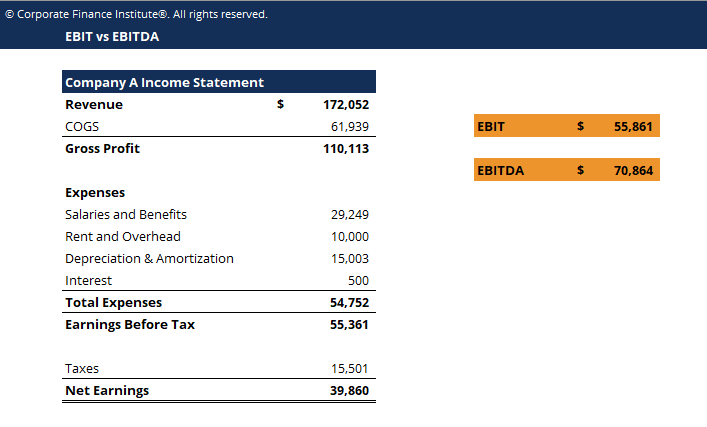 This EBIT vs EBITDA template will help you distinguish between EBIT and EBITDA calculations. EBIT stands for: Earnings Before Interest and Taxes. EBITDA stands for: Earnings Before Interest, Taxes, Depreciation, and Amortization. The difference between EBITEBIT GuideEBIT stands for Earnings Before Interest and Taxes and is one of the last subtotals in the income statement before net income. EBIT is also sometimes referred to as operating income and is called this because it's found by deducting all operating expenses (production and non-production costs) from sales revenue. and EBITDA is that Depreciation and Amortization have been added back to Earnings in EBITDA, while they are not backed out of EBIT. On an income statement, EBIT can be easily calculated by starting at the Earnings Before Tax line and adding to it any interest expenses the company may have incurred. EBITDA can be harder to calculate on the income statement. Depreciation and Amortization can be included in several spots on the income statement (in Cost of Goods Sold and as part of General & Administrative SG&ASG&A includes all non-production expenses incurred by a company in any given period. This includes expenses such as rent, advertising, marketing, accounting, litigation, travel, meals, management salaries, bonuses, and more. On occasion, it may also include depreciation expenseexpenses for example) and therefore requires special focus. The easiest way to ensure you have the full depreciation and amortization number is by checking the Cash Flow StatementCash Flow Statement​A Cash Flow Statement (officially called the Statement of Cash Flows) contains information on how much cash a company has generated and used during a given period. It contains 3 sections: cash from operations, cash from investing and cash from financing., where they will be fully broken out.